As long as you seek the world, you will never find comfort and joy. Love is the sign of Easter and we have to be witnesses of these things in our own lives. This love will never cease. The virtue of F I D E L I T Y, strengthen us even in the most difficult days, such as “Good Friday and Holy Saturday“. POWER, from which Christians live, is the mystery Christ left His disciples on Holy Thursday. It is the EUCHARIST, in which the Paschal mystery lives on. We invite you to celebrate with us the greatest mysteries of our faith, Jesus' triumphal entrance to Jerusalem, His Passion, Death and Resurrection. 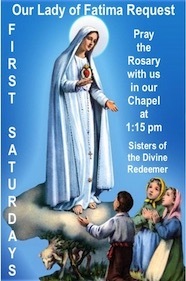 We invite you to pray the Rosary with us on First Saturday, May 4, 2019 at 1:15 p.m.
As we journey with Jesus during the Holy Lent, let us keep before our eyes the gift of His great love ... His life in exchange for ours. The holy season of Lent begins with Ash Wednesday, on March 6th. All Christians are invited to walk more closely with the Divine Redeemer during this time. To meditate on the Passion of Jesus Christ more deeply, we invite you to pray with us The Stations of the Cross on Fridays at 3:00 p.m.
A Mass of Thanksgiving with enshrinement of the relic of Blessed Alphonse Marie, was celebrated on Saturday November 24, 2018 at 2:30 p.m. at St. Anthony Chapel, 1704 Harpster Street, Pittsburgh, PA 15212. On August 28, 1849, the people of Niederbronn took part in the installation of the eldest of the Eppinger children, Elizabeth, in a little house in the village where four young Alsatian girls were waiting for her. 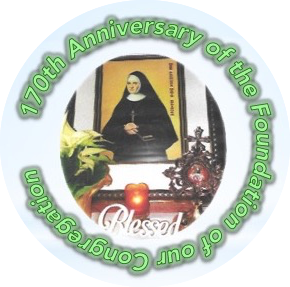 On the occasion of the Beatification and the 170th Anniversary of the foundation of our Congregation, our Holy Father Francis grants all believers a plenary indulgence from September 10, 2018 to August 28, 2019. Come and draw from the treasure of the Church the graces for yourself or for the deceased. The Mass of Thanksgiving for the Beatification of Mother Alphonse Marie Eppinger was celebrated in the Chapel of the Motherhouse on Sunday, October 14, 2018 at 10:00 a.m. by Very Reverend Bishop D. Zubik. On September 9, 2018 his Eminence Cardinal Giovanni Angelo Becciu, Prefect of the Congregation for the Causes of Saints presided the Eucharistic celebration and the ceremony of the Beatification of Mother Alphonse Marie. If you feel that you need help in your life search or discerment, here is something for you. Call, write or come and let yourself be helped. The Sisters of the Divine Redeemer ... Who we are?